PARIS — French President Emmanuel Macron faces one of the biggest tests to date in his young presidency, as his Cabinet is examining controversial immigration legislation before parliamentary debate. A record 100,000 people asked for asylum in France last year, and like elsewhere in Europe, public opinion has soured against migrants. 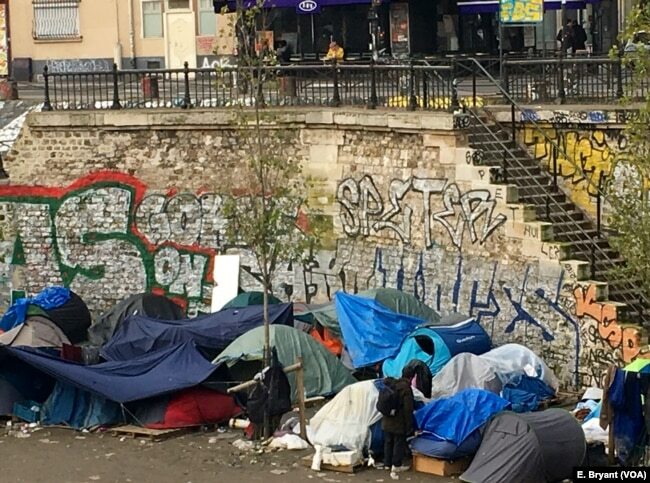 A migrant squatter camp in northeastern Paris. Periodically, police across the city raze these camps, but they invariably pop back up in other locations. A metro rumbles overhead as a small group of migrants stamp their feet to stay warm on a cold morning. They are standing in front of a northeastern Paris office that processes asylum applications. “I came to take refugee. I want to live here. I want a safe place. My government make problem for me. It follow me,” Abdel Kader, a 46-year-old migrant, said. Kader is an engineer from Jordan, who crossed Egypt, Libya, the Mediterranean and Italy before arriving here three weeks ago. His story is not completely clear, but he says he faces danger if he returns home. “No plan, I only want to take paper. The police catch me. Make trouble with me. I need paper,” he said. If French authorities find Kader’s story credible, he might benefit from proposed immigration legislation. It aims to speed up processing of asylum claims and make it easier for minors to get asylum status. But it also would toughen treatment for so-called economic migrants, sometimes doubling their time in detention centers and introducing jail sentences and fines for those crossing borders illegally to get here. Macron defends this mixed approach as firm and fair. He visited the port city of Calais last month, where a massive migrant squatter camp known as “the jungle” was demolished in 2016. Macron vowed there would never be another jungle — although several hundred migrants are still camped out in Calais. 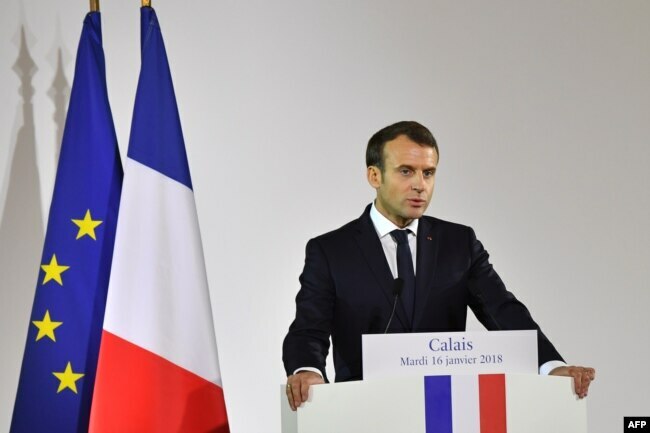 FILE – French President Emmanuel Macron gives a speech in the northern port of Calais on Jan. 16, 2018, vowing that France will not allow another migrant camp like the infamous “Jungle” to spring up in the city. A recent poll also shows most French believe there are too many immigrants here. But critics call the new legislation overly harsh. They include some members of Macron’s own The Republic on the Move party, which includes politicians from the right and left. Some say it violates basic human rights. 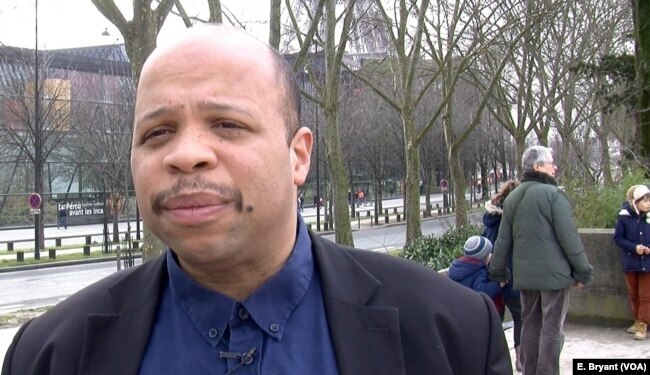 Louis-Georges Tin, who heads an umbrella association representing black French, says deterring immigration also does not make economic sense. “The best people from Africa, from Europe, from all over the world go in many other places now. We are losing age, we are losing expertise, we are losing human resources, we are losing our own identity,” he said. The group of asylum seekers does not seem aware of the fierce debate over their future. Louis-Georges Tin of the black umbrella group CRAN is among those critical of France’s immigration bill. A man who identified himself as Shinwari, from a part of Afghanistan with the same name, says after failing to get asylum in Austria, he is trying France. A few minutes later, police arrive to get the men to move on. Their final destination remains up in the air.